Potty training has been a relatively stress-free and enjoyable process for Vee and I. We started the learning process when he was 7 months old after reading about pre-potty training from The No-Cry Potty Training Solution * by Elizabeth Pantley. In fact, I have only read until the part on pre-potty-training and we have progressed very well on our own! A young and ‘blur’ baby is likely to accept the potty (just another chair) easier than an older and active toddler, who is busy with exploring the world. Starting early reduces the chance of diaper dependence, i.e. refusing to pee or poo anywhere other than the diaper. After diaper dependence has occurred, it could be very hard to get the child to cooperate on potty training, leading to much frustration. An early headstart helps the child be more aware of his body output and aids in his progress. Poop-less and pee-less diapers are easy to wash and don’t stink up the room. Being diaper-free early provides the bums with most breathability, especially during hot and humid weather. Some pre-schools only accept children who are potty-trained. I think long-term: easier with only 1 kid on diapers at any point in time. Have the right attitude: Start when you are ready, not because someone else wants you to start. Be positive and ready to face the challenges ahead. Recognise and remember your main objective: Why do you want to potty train your baby? Personally, I dislike flattened / squashed poop on bums and diapers, so cleanliness became my key motivation. When you face lack of progress or regression, remember your main objective. 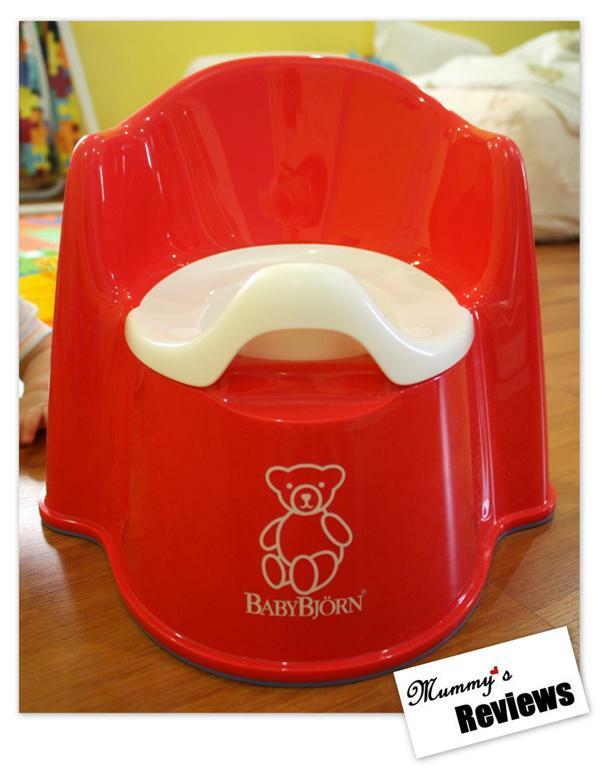 Choose a comfortable potty: We decided on the BABYBJÖRN Potty Chair, which is comfortable, steady and easy-to-clean. It is in red, Vee’s favourite colour. Start pre-potty training early: The No-Cry Potty Training Book suggests 10 months old. We started at 7 months old since I have already bought the potty. When baby is able to sit up without support, it is a good time to let him sit on the potty without a diaper. Great chance to air the bums too. Choose a suitable time for sitting on the potty: We started with once a day, after Vee is well-rested, well-fed and before his bath, when his diapers have to be off anyway. Gradually increase potty-time to during every diaper change. Be patient: If baby fusses and refuses to sit on the potty, it is ok. Just try again at the next diaper change or the next day. I believe in only associating pleasant experiences with the potty. In the beginning, Vee was on the potty for at most 10 minutes before proceeding to bath. It does not matter whether there is output or not. The objective of pre-potty training is to let baby get used to sitting on the potty. Lots of smiles and encouragement: This helps baby feel at ease during potty-time. The more relaxed she is, the easier to relieve her output. Usually, before the poo arrives, Vee needs to lie his head on my shoulder and hold my hands for support. Try to meet your baby’s emotional needs at the potty. Introduce potty training hand signs and words: Choose your words and/or hand signs for pee-ing and poo-ing. Every caregiver for the baby has to be consistent in using the same words / hand signs. Personally, we use “poo poo” and “wee wee”, which are easy to pronounce. Other words to introduce are the names of private parts, the potty (we simply call it “toilet”), farting, flushing, wiping, and washing. Make every little success a BIG deal: This helps baby know that she has done the right thing, and encourages her to repeat the success. When Vee first pee-ed into the potty after 1 month of pre-potty training, I was elated! After every pee / poo in the potty, I show a big and sincere smile, clap my hands excitedly, kiss him, hug him and say “Well done!”. After nearly one year of potty training, I continue to encourage him the same way and he is more than happy to use the potty. Support baby’s progress: There are odd occasions when Vee says he needs to poo in the midst of lunch. Fine, I cover the food, bring him to the potty, finish his business and then we continue with lunch. At other times, he tells me he needs to pee at the end of our bedtime routine. Fine, he goes to the potty, finish his business and we proceed to sleep. Even though these are little inconveniences, I actually feel happy that Vee is progressing well. Recognise if baby is giving real potty signals: This part is more for a cheeky toddler like Vee, who realises that he gets my full attention during potty time. Sometimes, he would say “poo poo” and point to the potty when he is actually seeking my attention. When I bring him to the potty or attempt to remove his diaper, he shakes his head. In the beginning, it could get irritating. After a while, I manage to tell between his real and the fake signals. Careful use of distractions: Sometimes, to help Vee sit a little longer at the potty (e.g. waiting for the poo to arrive), we sing and play simple finger games. He could also hold a simple toy. If he gets too excited with playing, he forgets about the need to poo and takes ages. If he is relaxed and quiet, the pee or poo arrives faster. Find out what works best with your child. Let baby watch you use the toilet: Vee has been watching me use the toilet since he was a newborn. During potty training, I describe to him what I do in the toilet, especially flushing the toilet, so that he does not develop a phobia for it. Use toilet at the same time: When Vee was stable sitting at the potty, we would also use the toilet / potty at the same time. Children love to imitate adults. Continue with potty training during travels: On overseas and out of town trips, we bring along a travel potty so that the routine continues. It could take only 3 days to break a child’s routine, so don’t risk regression once you have started potty training. Be cool about accidents: Expect pee/poo accidents to happen and be cool about it. We have our share of accidents and it takes only a few minutes to wipe up a pee puddle or scoop poo up from the floor. I have a pile of traditional square nappies ready to clean up mess anytime. Being prepared reduces the frustration. Use cloth diapers / training pants: These help the child to feel the wetness, recognise the discomfort due to wet diapers and progress faster. Some modern cloth diapers are very stay-dry, so may not aid potty training. Cotton and bamboo are feel-wet fabrics. Microfleece feels relatively wet before wicking the wetness away. Suedecloth stays very dry. 8 months old: First pee in the potty. Gradual progress to sitting on potty during every diaper change. 9 months old: Pee-ing in the potty a few times a day. 10 months old: First poo in the potty. Encourage him to poo every morning. Almost all poo done in the potty. 15 months old: Tells me before poo-ing — semi-potty trained. 17 months old: Sometimes tells me before pee-ing. Wakes up with significantly drier diapers in the morning, with large volume of pee in the potty. 18 months old: Tells me more frequently before pee-ing. Occasionally wakes up from nap with dry diapers. 23 months old: Finally tells me consistently in the day, diaper-free when awake and outdoors. Concluding keywords: be patient and consistent. All the best to you in your potty training journey! Sharing Time: If you have more potty training tips, do share with all of us in the comments box. i successfully potty trained my 3 year-old when he was 2.5 years. he even wakes up at night to pee at that time. however since a month ago almost every night he would wet his bed. i tried to reduce his milk consumption at night by only allowing a cup of milk before sleep and make it compulsory for him to pee before sleeping. sometimes it works but most of the time it didn’t and i have to put him back on CD. but this also doesn’t help much as he is heavy wetter, he’ll bet wet and leak even after 4 hours of sleep with newly change CD. do you have any tips on how to handle this problem of night wetter? Hi fazlin_yas, thank you for your comment. Being potty-trained at 2.5 years old is wonderful! You’ve done a great job! 22 months old Vee is now in the midst of night potty-training. I have read about “Potty Pause” before, which is a temporary regression for a potty-trained child. Could be due to factors such as a new younger sibling, moving house or changing bedroom / bed, etc. Vee’s also a super-heavy wetter. Recently, I increased his milk intake in the day and reduced the pre-bedtime feed to half a cup. He’s given snacks such as wholemeal bread or cereal to replace the other half cup. Yes, he also pees before going to bed. This seems to work as he pees only once in the night or early morning, or none at all. Another mum completely eliminates fluids before bedtime and it worked for her son. Similarly, shift fluids intake to earlier in the day and give solids as supper. I’ve also heard of mums waking their children up to pee. This is something I won’t risk trying as Vee’s a light-sleeper and it’d be worse if he can’t get back to sleep later. Recently, Vee feels uncomfortable after he pees in the middle of the night even thought he CD is not full / leaking. I change him when this happens and he’d be comfortable till morning. To prevent CD leak, you may explore increasing the inserts or changing to fitted + cover system. Of cos, this is more cost-effective if you’re planning to use the CDs on future child(ren). I find using fleece shorts very effective in containing potential leaks, since Vee rolls all over the bed when asleep. I love this entry about potty training! It’s interesting and useful to everyone. Thank you very much for your compliment, Mike! My mother in law uses similar methods like yours in potty training my 16 month old kid. I’m glad to say that the methods work. My kid has been dry for nights for past couple of months (as she needs to empty her bladder before sleep and on waking up). She can indicate her toilet needs too. Of course, having her on cloth diapers help lots in preparing her. I’ve never had the guts to let him go diaper free until he was able to tell me rather consistently. Even with our slow and steady method, he was daytime potty trained just before turning 2. For us, poo potty training was much easier than pee. At first, whenever I saw his expression that he was going to poo, I stripped his diaper off and plopped him on the potty. At 10 months old, he was too young to resist. Ha! He simply got used to poo-ing in the potty. Pee potty training took a long time, considering our journey was 7 to 23 months old. I was relatively relaxed about it, incorporated it into our daily routine and continued putting him on feel wet cloth diapers. When his body was ready, he finally could tell me in advance before peeing. Someday, it just happened and I was thrilled! Now he’s 2 years 10 months old and STILL wetting cloth diapers for naps and nights. I continue to encourage and remind him, and believe that he’d be consistently dry when his body is ready. At least, as a parent, I’ve done my part by starting to train him. Of cos, we’ve experienced regression and accidents too. Nice article. I’m now waiting for my 8 mth old to learn how to sit and will start toilet training him. Hi! Love the article!! Unfortunately, we’ve been a bit ignorant about starting the potty training earlier in our daughter’s life, and now she is already 31 month old and still in diapers. What would you recommend us do? She’s very active and always on the move, I doubt she would want to start sitting still for anything!! FYI, she wouldn’t even sit in her stroller!! Any tips?? Hi Liza, it’s very normal for a toddler to be active all the time. Even potty-trained Vee will hold his pee till the last moment so that he can continue playing and playing and playing. Then suddenly rush to the potty to relieve himself. Once done, straight back to playing again. Ha! For your daughter, is there anything that she likes to do for a little while? For e.g. doodle, scribble, sing with you, let you read her a favourite story? You may suggest letting her sit on the potty and do a SURPRISE activity that she likes. It’s ok with no output in the beginning, just get her to try sitting on the potty with no diaper on for 1 activity a day first. Then increase the frequency. – you may pre-select the design of a simple potty chair (view online or in stores without her knowing you’re looking for one), then bring her to the store to choose a preferred colour. Reason: if you let her choose any design she likes, may be overwhelming / unsuitable / out of budget / etc. – buy / borrow a potty-training story book and read to her, letting her learn that bigger girls start to use the potty. – when you use the toilet (and if you’re comfortable), show her the whole process of what you do. Then invite her to try doing the same as Mummy. At this age, she may be interested in imitating what adults do. If she declines the offer, it’s ok, just ask her again the next time. I wish I had came across your entry on potty training earlier. My boy is currently 27mths old. I would say his potty training started out all wrong right from the beginning. When he was 10 mths old. He constantly experience constipation and my mother who was helping me to take care of him started letting him sit on the potty to do his bowel movement. He was able to do that initially with coaxing. Subsequently he got resistance to the potty and cries alot (constipation) and would refuse to sit on the potty. I guess he must have associate the pain of constipation with the potty. I knew he weren’t ready for potty training so I didn’t push him further. Recently, he’s becoming more expressive with words and will touch his groin as if telling me he is passing urine. He is able to tell me he is “poo poo” but he still refuse to sit on the potty. He only likes to do it while standing up and will cry and protest if I force him to sit on the potty. The childcare teacher has been helping me to toilet train him for abt 2 weeks now. He’s in childcare centre all day and only comes back abt 6pm. The teacher only lets him go diaper free for about 2hrs everyday. So far the teacher feedback that he still doesn’t pass urine despite bringing him to toilet. In fact, he doesn’t pass urine at all when he goes diaper free. I notice that he will only pass urine when I put on the diaper back for him at home after his bathe. It seems like he’s still not ready for toilet training ah? should I stop first or persevere? Its not easy for me to do toilet training at him now as we also have an additional member (Di Di) in the family 3 mths ago so life is still pretty much hectic and chaos! I don’t have external help and can only rely on the childcare teacher and myself to toilet train my boy. Usually by the time my boy comes back from childcare, I have to manage him and Di Di alone for 2 – 3hrs before my hubby comes back from work and its really a big big challenge. I have tried letting him go diaper free only wearing shorts for him in the house initially and when he wets his shorts he was able to tell me “wet wet” touching the shorts. I also explained to him why its wet and how he should pass urine in the potty so his shorts won’t get wet. I try to catch his urine by bringing him to sit on the potty every 15 to 30mins. I had to resort to using my iphone to bride him and make him remain sitted otherwise he will run everywhere. He will only sit on the potty for fun and has only pee into the potty once so far when I was feeling up to the challenge of managing Di di and him alone at home. I had praised and cheered him on making a big fuss out of it so as to encourage him. Otherwise zero improvement so far. However I must admit Im not consistent with PT at home as there are days where im struggling like mad being alone with them. Im at my wit’s end now. Don’t know if I should give up and try again at a later stage when Di Di is bit bigger? but the more Di Di grows the more attention he will require too.. if i don’t start PT for boy now.. when? sorry for ultra-long message. Look forward to your reply. Your older boy may have developed diaper-dependence, which is rather common. It’s been his habit to poo standing up in his diaper, so it’s hard to break that habit until he’s more ready. He seems more open to potty-training for pee since he’s willing to go diaper-free and even wetted his shorts. These are positive signs! 🙂 I know it’s stressful to have older boy wet the pants and floor while looking after baby. Try getting some slightly-absorbent training pants? Personally, I don’t take the child to potty too regularly because it’s tiring, hard to keep up as a routine, and he may see it as a frequent disruption to his playing activities. Potty-training is a marathon, so you’d need a method that you can have the stamina to catch up with. Try putting on pants / training pants and let him wet himself, like he has. Continue to encourage him to tell you when he needs to pee, and showing him how to use the potty. Soon, he’d be open to using it voluntarily. If he’s wearing pants / training pants and needs to sit somewhere (e.g. highchair), try putting a folded waterproof sheet / towel underneath him so that he can’t wet the surface. Wet training pants are easily washed. Just rinse once with water, wring them and add to usual laundry for machine wash. I avoid hand washing because there’s no time for that. P.S. Some training pants options here rel=”nofollow”. May consider Flip Potty Training Pack, which we’ve tried. There’s a discount code at the right sidebar of this blog. Anyway, at this age, it’s pre-potty training. Like what you said, let him get used to sitting on a potty to prevent potty-rejection and diaper-dependence. What we do is, when I wake up early enough and Jae’s diaper is poop-free in the morning, I’ll let him sit on the potty or toilet bowl (if at my mum’s place). And use our pre-chosen phrase, facial expressions and hand gestures for pooping. E.g. “Jae, how about trying to poo poo? NNGGGG!” Often, he’d poo into the potty, since it’s his regular timing anyway. Soon, he also learnt to say “ng ng”. When he’s at the potty, I’ll talk to him about poop-ing, perhaps even do a rap or song on poop-ing to get him focused. Just make it fun and relaxing while being focused. On some mornings, I also sit him on the potty in the bathroom with me, close the door, and wash myself up while he tries to do his business. After a few minutes of no output and he indicates that he wants to get up, I’ll clean him up and put a clean diaper on him. Now at 14+ months, if I ask whether he has poo / “ng ng” in his diaper, he’d either shake his head (for no) or pat his diaper (for yes). Occasionally, he’d also say “ng ng” before pooping, and I’ll try to bring him to the potty/toilet bowl immediately. I juts ordered a potty seat few days ago for our 7 month old girl! Got the same as yours, so it’s good to know you’re loving it! Hopefully it will work for us too. I can almost always tell when she’s about to poop and can’t wait to try the new potty! But after reading your blog I’m a little discouraged as I didn’t expect it to take that long :-/. I mean, I knew it would take time and effort, but I thought we’d be done by 18 months for sure… Doesn’t sound like it though. Oh well. My 11 month old son started using his potty chair yesterday. He has pee’d on it a total of 8 times in two days. However, when he started to poop and I tried to put him on it he arched and screamed. It ended up a big mess! He has no resistance when I put him on it otherwise and seems to pee almost immediately when he sits down. Any tips for encouraging him to poop on it? I’ve been battling diaper rash with him for weeks with multiple prescriptions. The only real improvement is with cotton training pants instead of diapers, but the poop on his skin is a major setback each time! Thanks! That’s great for a start! If he doesn’t want to poo in the potty chair yet, then let him be, to prevent negative feelings. If you can estimate the usual time he poops, then before he starts to do so, put him on the potty, let him pee if he wants and teach him to make “ng ng” sounds / contract his tummy muscles to poo. #2 Jae doesn’t poop at regular timings and often had very loose stools several times a day if he eats foods with laxative effects. So he was bothered by diaper rash and yeast infection if I missed the poo on his diaper for a while (especially first thing in the morning). Recently, his poo timings are more predictable and no loose stools, so the rash has disappeared. For diaper rash, could it be sensitivity to the particular disposable diaper brand? Perhaps some chemical or fragrance inside? You’d need to experiment to find out which brand is a good fit for your boy’s skin, since he’s likely to use them (even if occasionally) till fully potty-trained. It could also be sensitivity to chemicals in disposable wet wipes. Usually we use cloth wipes with water, and wash under water. If we need to use disposable wet wipe, then choose a mild one with no added fragrance. Before wiping, rinse and wring under tap water first to remove the chemicals. When battling rash, the doctor suggested we use Egozite diaper cream. This cream will coat cloth diapers / training pants, so we’d need to use it with disposable diaper until the rash clears up. It protects the skin rather well. When yeast infection develops (many small red spots, often in circular patches), then must use an antifungal cream. Usually, Jae’s clears up within a week, if we catch it early. Hi, I am trying to potty train my 1 yr old daughter. She peed little bit two times but have more accidents while i let her day go naked. I keep taking her every 10 to 15 mins to the bathroom but no luck. When i turn around for few seconds, accidents happens. What should i do when she pees or poop on the floor ? How should i react to her accidents in front of her? This seems like she isn’t ready yet to go without diaper. How about trying “pre-potty training” before actual potty training? For easy cleaning up at toddler stage, I let the child wear cloth diaper (feel wet ones are good for potty training at home) and bring him to the potty from 1 time a day at first, then build up to every ~1-2hours. I don’t bring the child to the potty too often, cos it distracts our activities and he may feel that I’m too “naggy”. I’m so happy I found this article, I even have it book marked. I’m due for my first child in june, I plan on fully CDing till potty trained, and my goal is to have my baby potty trained before the age of two. I read in a sleep/potty training book about babies being able to show interest in a potty and understanding the need to go as early as six months, and I have looked in many places for a list of things to help this process early on, Thank you so much! This is a great article, very helpful. I ‘ ve been potty train my twins boys since right after their first birthday. They are now 1 and half, it is quite challenging and very tiring with two babies and one bathroom. Lol but I keep soldiering on hopeing to be diaper free one day soon. I basically put the boys on the potty right when they get up after every meal and drink and right before bed. Some days they do so great, they go several times. We’ ve also gone days without cleaning a poo filled diaper which is great . 🙂 they just pooed in the toliet each time. But then we have days that they Hardly do anything. It’s like one step forward and two steps back. Nothing is very consistent at this point. I refuse to give up it’s not in my personality. Just continue with the same rotinue everyday. I’m very patient with them figuring they will catch on eventually. I still have them in disposal diapers cause I have carpets and I’m a afraid of a big mess. Also , I’ m using on regular toilet with a toilet ring . Any advice on what I can do to make it more consistant. Any advice is so appreciated. Someday, the boys may progress to wanting to pee at very short notice. To let them be independent, I like placing a potty in the toilet. This way, he can go even if I’m busy. Choose a big, stable one with a raised front to avoid spills. We use those from BabyBjorn (review here) and Ikea. Hi Melissa, congrats on your girl’s progress! You’d need to discuss with the nursery school on how the teachers will support her progress. All the best! We started at 8, soon began to catch all poops and some pees, after a month and a half we cought all the pees and woth ten months baby crawls to me or to potty when jas to go, also we put him on potty before sleep and he wakes after 7hrs to pee we put him on potty and he cont. To sleep two more hrs.we are often out on bike and walks, rarkey accidents happen.more you try to catch but no pressure on baby, more baby will be ready to communicate and will eliminate more in the potty. Thank you for sharing your experience, Jovana! I have been looking for an article like this! I know it was written a while ago but thought I would ask a question and see. We have done a lot of what you outlined, thanks to my mum. My daughter is 17 months now and we have been going mostly nappy free for a few weeks. If I could let her walk around naked from the waist down, she would be 100% trained – she walks over to the potty and goes, but she regresses a bit with pants on. Initially she was great, did tiny accidents then waited till we got to the potty, and I thought we got it. Sometimes she will still let me know before hand, or try to pull her pants down and we get to the potty in time. But some days it seems like she forgets everything! And just does full wees and even the occasional poo in her pants (which she hadn’t even done in her nappy for months) with hardly any warning. It makes it hard to go out. I wasn’t sure if maybe the fact that she is still in night-time nappies was confusing her? There are no emotional reasons for her regression (no siblings, change of life events) so do I just keep going with the accidents getting worse, or put a cloth nappy on when we go out and try again later? Am I expecting too much?